After spending several days in Tasermiut Fjord, our plan was to move on to Prince Christian Sound, which involved sailing out across the open ocean. But once again, Greenland had its own ideas for our trip. Shortly before we were due to leave Tasermiut, the captain got a weather alert about a coming storm and decided that it was too dangerous for the yacht to head out into the ocean. Our plans for Prince Christian Sound were scrapped and we spent three more days in Tasermiut. Single shot, additional exposures for highlights, additional shot for moon, focal length 45 mm, aperture f/8, shutter speed 13 seconds, ISO 100, tripod. I was disappointed, but it’s hard to be bitter when your surroundings are as beautiful as the fjords of Greenland. On the way back to Narsarsuaq, we made one last stop at the picturesque small town of Qaqortoq. 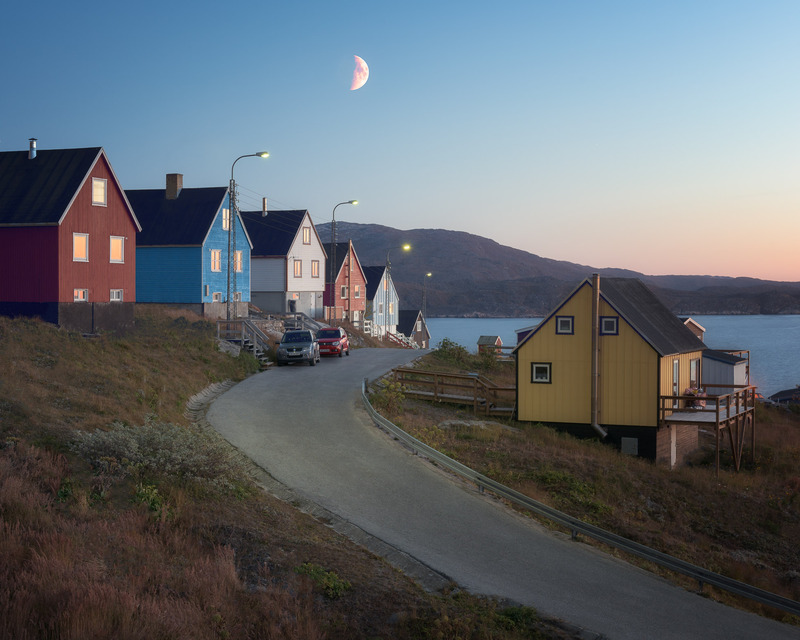 Like many of Greenland’s towns, it’s lined with small, brightly colored homes overlooking the water. It wasn’t what we had planned, but again, it’s hard to be too disappointed when your surroundings are this lovely. On the way to Qaqortoq, there is a natural pool with thermal water that is consistently 39 degrees Celsius, a welcome change after the bitterly cold temperatures outdoors. On our last night in Greenland, we gathered in the pool under a brilliant starry sky. The temperature outside the pool was a frigid 10 degrees Celsius, but we were warmed by thermal water and a bottle of white wine and the cold seemed very far way. And demonstrating once again how futile it can be to make plans, the Northern Lights put on a spectacular show that night, dancing above a thermal pool full of photographers who were too tired and tipsy to get out and retrieve packed-up camera gear. We didn’t even particularly mind that we were missing incredible shots of the Aurora Borealis; it was enough just to see them. On our last day in Greenland, we photographed Qaqortoq just at sundown, with a sliver of moon suspended over the town. Greenland was an adventure and now it was time to head for home. My wife and I had packed all of our things and decided to make one last look through our cabin to make sure nothing was left behind. There was something left behind, as it turns out. In one of the cabinets, my wife found a very large and very dead rat, and one which I am certain was not there at the start of the trip. As I had not come to Greenland prepared to dispose of an animal carcass, I asked the captain for help. I suppose piloting a ship in the Arctic makes a person impervious to emergencies both large and small. He was utterly unperturbed and simply said, “An unauthorized passenger on my ship?” With little fanfare, the rat was given a burial at sea and we continued toward home, tired and rodent-free. This entry was posted in Landscape and tagged Greenland, Qaqortoq.